Like most people with diabetes I seem to be on an endless quest for good-tasting food that won't play havoc with my blood sugar levels. What I keep looking for is low-fat food packed with nutritious carbohydrates. 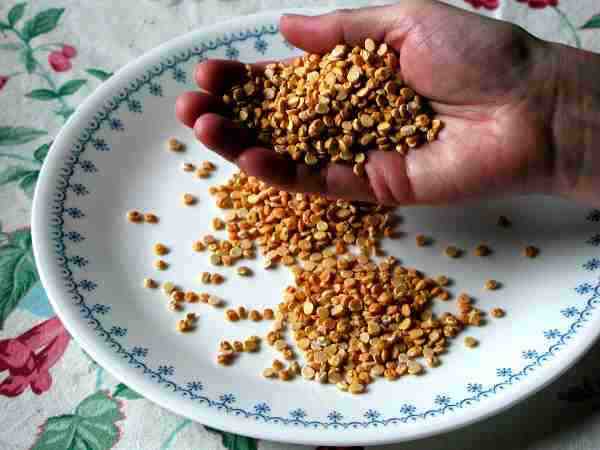 Chana dal, which is shown here, looks just like yellow split peas but is quite different. The problem is that many foods high in carbohydrates send our blood sugar levels skyrocketing. But when I found the food of my dreams a couple of years ago, I ignored it because I had no idea what it was. This food—chana dal—is practically unknown in the West, but is becoming available here too. Chana dal is a bean that comes from India, where they appreciate it very much. My interest in chana dal began when I started gathering information for my Web page about the glycemic index, which ranks foods on how they effect our blood sugar levels. My article about the glycemic index appears elsewhere in this magazine. Gathering studies for my glycemic index page, a couple of years ago I stumbled on references in the professional literature to something called "Bengal gram dal." I included it, although I didn't know what it was. Then, someone sent me e-mail asking about it. My initial reaction was to take Bengal gram dal out of the glycemic index, because the number was almost unbelievably low. It has almost no effect on your blood glucose level. This is something that is very important to anyone with diabetes and to many other people as well. Technically, it has one of the lowest indexes of any food on the glycemic index. I didn't take it out of my glycemic index page—because I found an Indian market in Los Angeles. The proprietor told me that "Bengal gram dal" was the British English term for what is called "chana dal" in Hindi, a fact I've since confirmed. In Bengali it's known as "chholar dal." This bean looks just like yellow split peas, but is quite different because it doesn't readily boil down to mush. It's more closely related to garbanzo beans, or chickpeas. The differences are that chana dal is younger, smaller, split, sweeter, and has a much lower glycemic index. But you can substitute chana dal for garbanzo beans in just about any recipe. Chana dal has now become a regular staple of my household. I have diabetes and prize chana dal's very low glycemic index. And I prize the wonderful taste just as much. I love chana dal prepared in several different ways, just like any other sort of bean. Chana dal may not be the end of my quest for tasty food that is good for me. Maybe scientists will invent the perfect food sometime in the 22nd century. Meanwhile, I keep on eating my chana dal and encourage you to try it too, whether or not you have diabetes. How do you use chana dal? Among the many recipes, see Chana Dal Recipes. This article originally appeared on the Diabetes Digest site, April 1999.